Our 50th Anniversary celebration will take place throughout the weekend of the 17-19 August, 2018 with Family BBQ and Pool Party on Sunday 19th August. 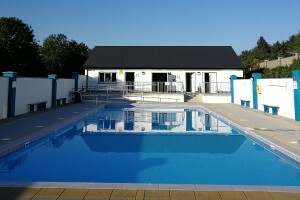 Charlestown Outdoor Swimming Pool was built in 1968 and has served thousands of people over the years as a fun, safe and healthy swimming facility as well as a training ground for lifeguards and Irish Water Safety Swim Instructors. In 2017, the pool underwent a major refurbishment that provided a heated and refinished pool basin and deck along with disabled access facilities. The pool is run by a voluntary committee who provide for open swimming along with Swimming Lessons and Water Safety Instruction. Our 50th Anniversary celebration will take place throughout the weekend of the 17-19 August, 2018. To mark this milestone, we will be holding a Family BBQ Pool Party on the 19th, which is gearing up to be a fun filled day. Part of the celebrations include a sponsored 50KM Swim Challenge to help raise funds for enhancements to the pool. We would like to invite everyone to participate, be it 1 width, 10 lengths or more, with or without armbands. Every participants’ distance will be recorded to help us smash this challenge. This is about taking part and encouraging everyone to swim. You can pick up a registration / sponsorship form at the pool or sign up on Eventbrite* and join the GoFundMe team to start getting your sponsorship. If you have any questions contact us via email, phone or Facebook. If you are away that weekend but would still like to participate, we’d love to share any pictures or videos of your swim on our social media accounts, using #Fun50KSwim #50Kfor50K!! Please share this Go Fund Me Sponsorship link far and wide and encourage or challenge everyone you know to help. All sponsorship and donations will be used to improve Charlestown Swimming Pool through these additional phases of development that are required. Installation of a retractable telescopic cover that will allow us to extend the season and encourage more use of the pool in inclement weather. Sustainable solutions to reduce electricity charges for heating the water. Car Parking facilities, footpaths and finished driveway. Enhanced changing room and staff facilities. Development of property to the rear of the dressing rooms to provide further community facilities. Here is a picture of the proposed cover. It comes with an estimated cost of approx. €200,000 so all donations are greatly appreciated. As we approach our 50th Anniversary, we’d like to thank everyone that supports Charlestown Swimming Pool in any way.